Westwood was built, according to folklore, on top of Indian burial grounds. I never found an arrowhead when excavating the driveway of our home, the broken bits and pieces strewn here and there as I pretended to be on a grand adventure for National Geographic, but I trusted the elders of the neighborhood who talked of ghosts and objects disappearing. I wanted to see a ghost–just once, a barely-there specter that whispered secrets to me and me alone. And though I never got to hear anything go bump in the night, I’m no less the believer. I lived with ghosts of a different sort. Westwood was a suburb in South Memphis where hardworking, middle-class whites lived before the white flight of the early seventies. When I was born in ’74, there were no whites in my neighborhood, just hardworking, barely middle-class blacks earning a living and proudly proclaiming a plot of earth as their own. Despite my grandmother’s disapproval, my parents bought their three bedrooms, one bath home on Lillian Drive in Westwood shortly after my birth. My grandmother, Big Momma, was sure that her daughter-in-law was going to mire her son in debt. Daddy’s job as a warehouse worker with the VA Hospital and Momma’s job as a manicurist was enough to keep their little family afloat. Momma planted pink azalea bushes and golden burning bushes in the flower bed in front of the living room windows. The new sofa, purchased on credit, was preserved in plastic. The faint smell of bleach clung to the air, testifying to the cleanliness of the home. Years later, this house appears often in my dreams. Momma’s mission to create the perfect home didn’t erase the trauma of her loss. How do you survive ghosts? How do you continue on despite the constant reminders of what was lost? Once, when Momma suffered from one of her dark spells, she told me what happened in Germany. This was one of the few times she ever discussed my older sister, Angela. She told me Daddy came home to the Army base where they were stationed to a trail of blood that led from the front door to the bedroom. “The coffin was so tiny,” she said, her eyes gazing at something I couldn’t see. I asked where the miscarried infant was buried, but she mumbled something low and waved her left hand, dismissing the question. I didn’t ask again. The twin boys were born six months too early, their tiny lungs undeveloped and unready for this world. I found a photograph of Momma round with pregnancy, a black and white checkered maternity blouse floating about her as she appeared to be opening gifts. “Momma, were you pregnant with me?” I asked when I found the photo. Framed baby pictures and photo albums that chronicled my progression into childhood graced end tables, but this photograph I had not seen. “No, baby. I was pregnant with the twins.” This was the first time I heard of yet another birth, more siblings who did not live to be a part of my family. As a five or six year old, my concept of death was still murky, but I was sure that they were still there in the home with us. I knew Momma was haunted when she had her sadness and didn’t feel well enough to drive me to school. When she said no to swimming lessons and no to playing at friends’ houses, it was because the specters of my older siblings lurked about, reminding her of how lucky she was to have a living daughter, and that life could be taken away from her in a second. For Momma, the dead lingered. The Chickasaw, who occupied the land that became Memphis long before the whites and the blacks, had their own way of dealing with their dead. 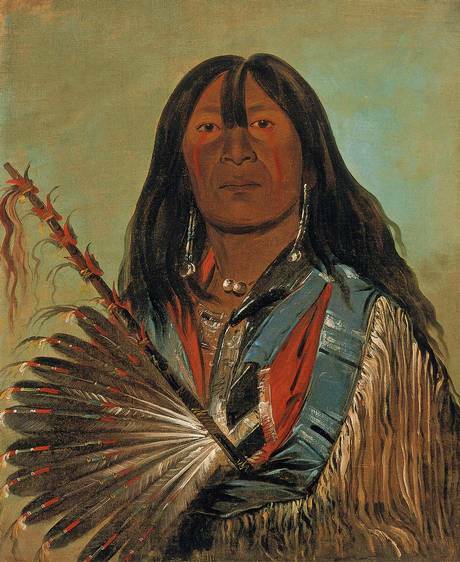 The Indians discharged guns and whooped to drive the ghosts of dead men away. After the souls were induced to leave the neighborhood of their living relatives, they traveled westward, passed under the sky, and proceeded upward to the land of The One Above or the Breath Holder, their ancient idea of heaven. The name “spirits road” was given to the Milky Way that was regarded as the trail upon which souls ascended. I imagine my adult self returning to the three-bedroom home on Lillian Drive with my own rifle, discharging it over and over again, startling the occupants of my childhood home. One, two, three, the spirits of what would have become my older sister Angela, and my older twin brothers, Sean and Shane, would flee from this place, would stop haunting my mother with images of what they would have looked like at age seven, celebrating a birthday party, or at age sixteen, asking for the keys to the car. There would be no more crying spells and days where Momma couldn’t rise from bed and bathe herself, her usually immaculate hair mussed. I can see Angela, Sean, and Shane slipping and sliding upward on the Milky Way, gurgling their baby gurgles, fists flying, hospital blankets floating around them, as they are taken into the arms of The One Above. I, too, would be free, free to roam beyond the only yard with a fence in the neighborhood. I would have childhood stories of biking through the meandering streets, stopping by the candy lady’s house around the corner, and purchasing dill pickles with peppermint sticks stuck in the middle of them. I could tell my future children about climbing Keisha’s huge oak tree and double dutching with Cookie and Kim three houses down. I would have memories of scraped knees, banged elbows, and numerous crushes. Instead, Angela, Sean, and Shane refused to travel westward. These spirits, because of the ferocity and viciousness of my mother’s love, vexed me. They occupied my mother’s space, prevented her from playing dolls with me. They caused her to say no when I asked if she could take me to the movies, to parties, to the Girl Scouts meetings. I have few memories of her without glazed eyes, hunched shoulders. The front yard had a deep rut that circled the front yard, made by my bike because I wasn’t allowed to leave the lawn. “B, why get her a bike if she can’t use it?” my Dad asked. “She can ride it in the yard!” was Momma’s terse reply. I never got to see the interior of the candy lady’s home, the little old lady who supplemented her social security checks with candy sales to neighborhood children. I had to ask Keisha next door to bring back a dill pickle, bribing her by not asking for my change when she returned. Waiting for Keisha at the gate, my fingers entwined within the chain-link fence, the image of five or six children running away from my yard, became a recurring theme. Left behind. Forgotten. A few times I was allowed to play at Keisha’s since she was right next door, but not often. And I remember Cookie and Kim coming to the house with chocolate chip goodies, presumably to share. I don’t know what Momma told them, but I watched them walk down the street with their cookies from my barred bedroom window. The only time I went beyond the Westwood border was when I attended a school in my grandmother’s neighborhood. To prevent me from becoming a latch key kid, I attended school across town where I could walk to Granny’s after school. There no one knew I couldn’t leave the yard. Alton Elementary was out of reach of the spirits. Years later, I see the frightened woman who attempted to keep her household together with plastic and bleach. There was nothing to keep the uncertainty of the world away except for a chain-link fence and vigilance. My younger self deeply resented Momma and wished I could have experienced a childhood of freedom. There is still anger, yes, but anger dulled with understanding. Now that I’m thirty-eight and attempting to start a family, I wonder how my mother survived the haunting of her miscarriage and her premature twin boys. I long to forgive the borders and boundaries of my childhood, the intense loneliness and isolation of my youth. I long to forgive, because I may soon be protecting a child of my own. Sometimes I drive past the house on Lillian. The driveway is now paved, the carport is now a garage, and the azaleas are long gone. Even though I longed to escape its front yard, I’m still drawn to the house every so often, slowing down so I can gaze at my childhood home. Lonette Stayton is currently an MFA student at the University of Memphis. She is working on her thesis, Fractured Self–A Life in Snapshots, and plans to graduate in the spring. Her middle school students’ passion for writing inspires her every day. This entry was posted in Archives, Essay and tagged winter2014 by Mary Akers. Bookmark the permalink. Moving piece about the way our childhoods shape our adult lives. Well written and enjoyable!